It’s boxing day here at Madtini Labs, and everyone is kicking back after the rush and craziness of Christmas and the pre-holiday shopathon and party season. We have all the discount electronics we can use so we are staying away from the sales and enjoying these Wildberry Snowjitos made with Malibu Snowflake Rum. 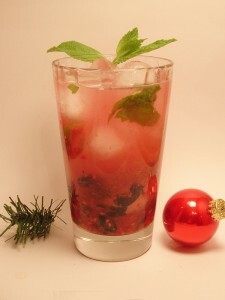 If you missed it we used Malibu Snowflake Rum for 2 of our 12 Days of Madtini Cocktails; the Snowjito and the Winter Whiteout. Muddle the blueberries, raspberries, lime wedges, sugar and mint leaves in the bottom of a high ball glass. Fill glass with ice cubes and pour in Malibu Snowflake Rum and Club Soda. Garnish with a sprig of mint. Drink adapted from a Micah Dew (askmybartender.com) article in the Edmonton Journal.